Contains Sample Diversion System for the collection of whole blood samples for laboratory testing. Also includes the DONORCARE™ Needle Guard. •At ambient temperature up to 8 hours after blood collection. •At refrigerated temperature up to 3 days after blood collection if AS-1 red blood cells are prepared within 3 days after whole blood collection. The leukocyte reduced red blood cells may then be stored for the maximum allowable dating period. • If sample diversion system is not used, donor samples may be collected using an alternate method following standard procedures. • Nominal tubing dimensions of product are 0.118" inner diameter x 0.025" wall thickness. • Upon removal of BLOOD-PACK™ unit from the clear plastic overwrap, visually inspect the unit. • Do not use the product if the in-line cannula is broken and/or anticoagulant is present in the sample pouch or in the tubing from the in-line cannula to the sample pouch and donor needle (see Figure 1). Note that condensation in the empty tubing of the BLOOD-PACK unit is expected as a result of the sterilization process. • Do not use unless the solutions are clear. 1. Identify BLOOD-PACK unit using appropriate donor identification system. • Position primary container on the donor scale as far as possible below donor arm. 4. Visually inspect the tubing from the in-line cannula to the sample pouch and donor needle, as well as the sample pouch to reconfirm that there is no anticoagulant present. Note: Ensure that the sample pouch remains below the donor's arm. 5. Follow blood center procedures, apply pressure to donor's arm and disinfect site of venipuncture. 7. Following blood center procedures, perform venipuncture, appropriately secure donor needle and/or tubing and release hemostat. 9. Allow the sample pouch to fill with blood according to center procedure. Monitor blood flow into sample pouch. • The sample pouch contains an average fill volume of approximately 53 mL with a maximum fill volume of approximately 60 mL when filled to capacity. • If less blood sample volume is required, the flow to the sample pouch may be stopped prior to completely filling the pouch. For example, in order to target a fill volume of approximately 40 mL, fill to the level indicated by the arrows in Figure 1. Ensure the pouch is hanging vertically. • The tube leading from the Y-junction to the sample pouch contains an additional volume of approximately 2 mL . • Do not elevate or squeeze the sample pouch as this could cause blood to backflow from the sample pouch into the collection system. • Once the sample pouch is filled to desired volume, complete steps 10 - 18 within approximately 4 minutes to avoid possible clot formation in the tubing and/or sample pouch. 10. Close the blue clamp on tubing between the Y-junction and the sample pouch. 11. 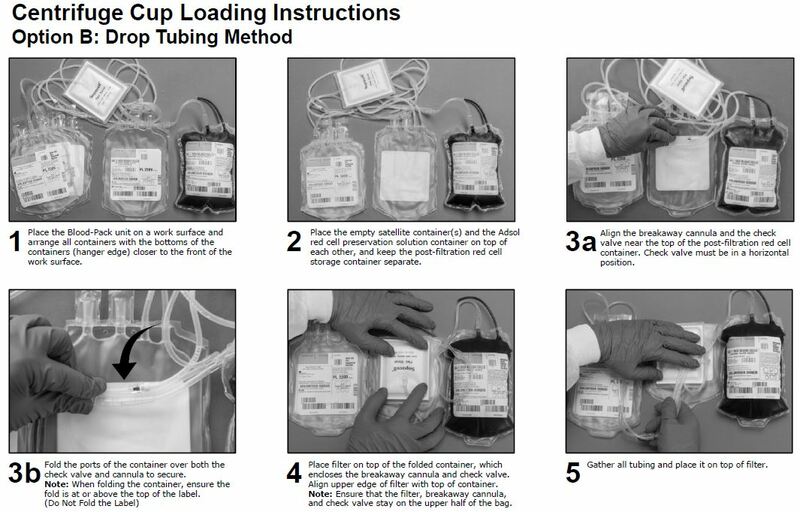 Break the in-line cannula below the Y-junction in the donor tubing to the primary container allowing blood collection to proceed. To completely break the in-line cannula, grasp with both hands. Snap it at a 90° angle in one direction, and then bend it at a 90° angle in the opposite direction. Ensure the in-line cannula is completely broken and that the blood flows freely to the primary container. 12. Following blood center procedures, mix blood and anticoagulant in the primary container immediately and at several intervals during collection. 13. Following blood center procedures, hermetically seal the tubing between the sampling site and the Y-junction to maintain sterility of the blood collection system prior to removing blood samples. • Do not proceed with the remaining steps until the tubing leading to the sample pouch is hermetically sealed between the sampling site and the Y-junction. To maintain the whole blood collection container as a closed system, the tubing between the sample pouch and Y-junction must be hermetically sealed prior to inserting the access device into the sampling site. Failure to do so may lead to contamination of the whole blood collection. 14. Insert the access device by pushing firmly into the sampling site until the membrane seal is penetrated. 15. Open the cap on the access device (if applicable). Hold access device so that the sample pouch hangs down. 16. Directly align the vacuum sample tube with the internal needle in the access device. Insert vacuum sample tube into device. 17. Allow vacuum sample tube to fill with blood then remove from the access device. 18. Repeat steps 16 and 17 until the desired number of vacuum sample tubes have been filled. • If the access device needs to be replaced, use a hemostat to clamp the tubing between the sampling site and the sample pouch. Then, grasp base of sampling site with one hand and pull the access device out with the other hand. Firmly insert the new access device. Remove hemostat and continue sampling. • If the access device is assembled such that the outer barrel is screwed onto the Luer, make sure to rotate clockwise upon removal to avoid barrel detaching from Luer. • The access device can only be replaced one time. Luer or sampling site. Discard used access device appropriately. 19. 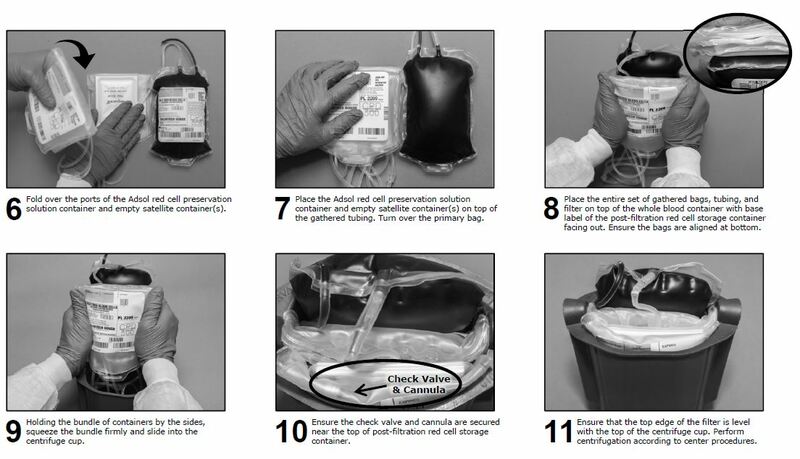 Collect the appropriate volume based on BLOOD-PACK unit used. 20. Release pressure on the donor’s arm. If appropriate, apply hemostat to donor tubing between the needle and the Y-junction. 21. Hermetically seal donor tubing between the in-line cannula and the primary container. a) Place folded sterile gauze over puncture site and hold in place with finger tip without exerting pressure. b) Hold sides of needle guard near the front, between the index finger and thumb. Pull the tubing smoothly until the needle is locked into the needle guard. • Listen for the 2nd “click” as the needle is drawn into the needle guard. • Ensure the tubing cannot be pulled through the needle guard. 23. Remove and discard the sample diversion system and needle guard into an appropriate biohazardous waste container following established procedures. 24. 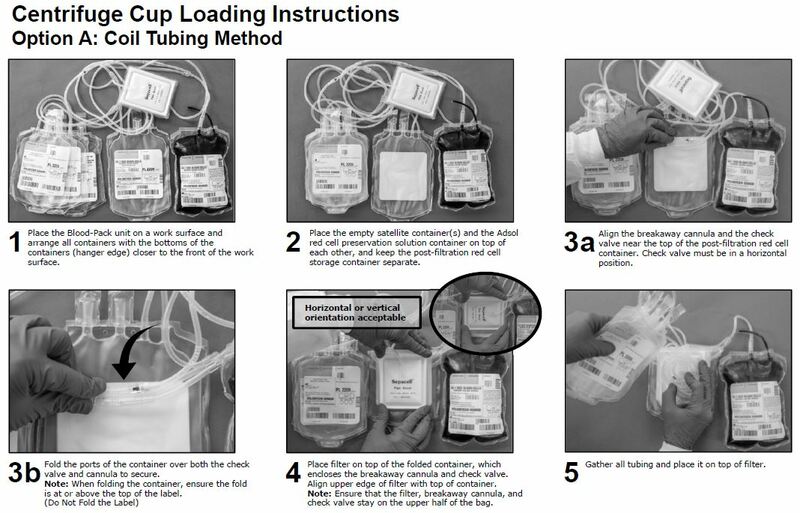 If the donor tubing is not hermetically sealed directly above the primary container, then strip the blood from the remaining donor tubing into the primary container. Mix and allow tubing to refill; repeat once. • If a platelet concentrate is to be prepared, it should be separated within 8 hours after blood collection. • Fresh frozen plasma should be separated from the red blood cells and placed in the freezer at -18°C or colder within 8 hours after blood collection. a) Within 8 hours of blood collection if whole blood is held at ambient temperature. b) Within 3 days of blood collection if whole blood is refrigerated. 25. At the appropriate time, prepare the BLOOD-PACK unit with Integral Filter for centrifugation. 26. Thoroughly mix the primary container end over end. 27. 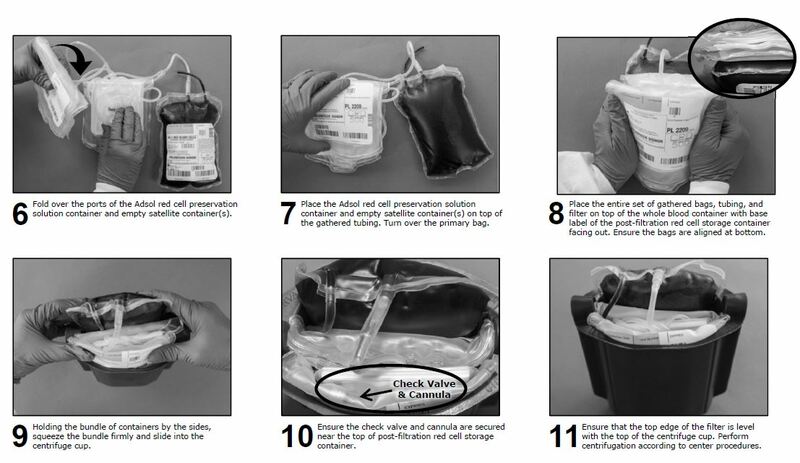 Load the BLOOD-PACK Unit into a centrifuge cup per the instructions on page 3 or 4. Page 3 describes Option A, the coil tubing method of cup loading. 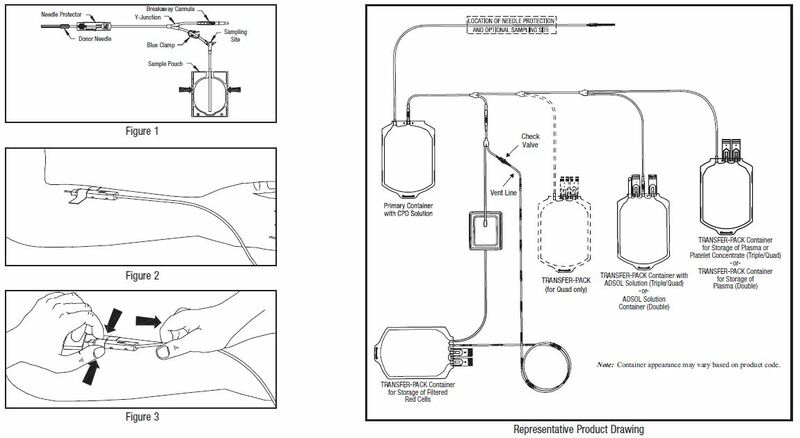 Page 4 describes Option B, the drop tubing method of cup loading. • This guide is one method for centrifuge cup loading and applies to all Flex-Excel configurations. The specific stacking order and methods may vary depending on the workstation setup, centrifuge equipment, and Standard Operating Procedures. • It is important to pack the filter properly in the centrifugation cup to avoid damage to the filter during centrifugation. • Check valve must be placed in a horizontal position (Figure 4a, page 2). Avoid the clear (red tip) side from pointing downward (Figure 4b, page 2). See step 3 on page 3 or 4. • Do not place the filter, breakaway cannula or check valve in the lower half of the centrifuge cup. See step 5 on page 3 or 4. 28. After loading the BLOOD-PACK Unit into the centrifuge cup, perform centrifugation according to center procedures. 29. Following centrifugation, remove containers from the centrifugation cup taking care not to disturb the red blood cell / plasma interface. 30. Place primary container in a plasma extractor and apply pressure. If applicable, clamp off tubing below Y-Junction leading to secondary TRANSFER-PACK™ container not to be filled with plasma. Open the cannula on the top of the primary container to transfer plasma into the empty TRANSFER-PACK container. 31. When the desired amount of plasma has been removed, clamp the tubing between the plasma container and the Y-connector closest to the plasma container and release pressure on the primary container. 32. Suspend the ADSOL red cell preservation solution container, open the cannula on the ADSOL solution container and drain the contents into the primary container of the CPD red blood cells. Clamp the ADSOL red cell preservation solution tubing. 33. Hermetically seal the tubing between the Y-connectors or above the plasma TRANSFER-PACK container. Be careful to avoid fluid splatter. 34. Mix the ADSOL red cell preservation solution and red cells thoroughly. Note: If the ADSOL red cell preservation solution is not added to the red cells, ensure appropriate labeling of the red cell container. The pre-filter container does not include tubing with segment numbers. A CPD red cell without ADSOL red cell preservation solution may be stored between 1 and 6ºC up to 21 days after collection. The attached SEPACELL™ FLEX-EXCEL™ filter should not be used to leukoreduce a CPD red cell without ADSOL red cell preservation solution. Precaution: Red blood cell products collected from certain donors may have extended filtration times and the potential for ineffective filtration and leukoreduction. 35. Mix unfiltered AS-1 red blood cells thoroughly. Invert the unfiltered AS-1 red blood cells and hang the filter set such that the filter remains vertical. To achieve maximum flow rate, allow the set to hang to full length. 36. Inspect all tubing to ensure it hangs freely without kinks. If desired, a temporary clamp may be placed on the vent line, but must be removed prior to expelling air through the vent line. 37. Break the in-line cannula above the filter to start filtration. Note: If filtration of red cells is initiated at ambient temperature, the filtration process can be completed at either ambient or refrigerated temperature prior to storing the red cells between 1 and 6°C. However, for optimal filtration time, it is recommended to complete the filtration at ambient temperature. 38. As the filtered red cell storage container is filling, or when flow stops, clamp or pinch the tubing below the filter to occlude flow. Note: While the check valve is designed to prevent blood flow from entering the vent line below the valve, blood may flow down and fill the valve. 39. Squeeze the filtered red cell storage container to expel air from the filtered red cell container through the vent line. Continue squeezing the filtered red cell container until the vent line segments and check valve are filled with blood as desired. 40. Remove the clamp or release the tubing below the filter to resume red cell flow through the filter. If desired, the temporary clamp may be replaced on the vent line immediately after removing the clamp below the filter. When filtration is complete, air can be observed in the inlet side of the filter. Note: While the check valve is designed to prevent blood flow from entering the vent line below the valve, it is normal for air to pass through the valve and enter the vent line tubing. To avoid air from entering the vent line below the valve, the vent line may be clamped during this step, or blood may be expressed beyond the check valve during the air expel operation. 41. Hermetically seal and detach the tubing below the filter. Also, hermetically seal and detach the vent line between the one way valve and the top donor segment number. 43. Store the AS-1 red blood cells, leukocytes reduced between 1 and 6°C. 44. Infuse the red cells within 42 days of collection. USP Definition of “Controlled Room Temperature” United States Pharmacopeia, General Notices. 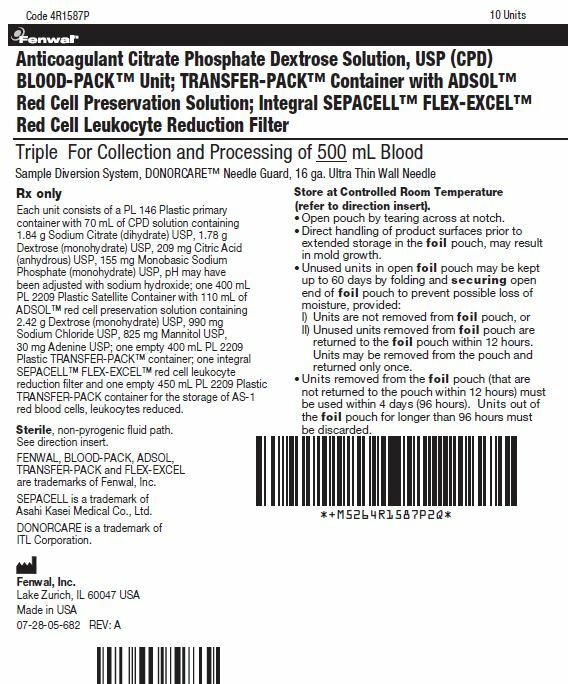 United States Pharmacopeial Convention, Inc.
FENWAL, BLOOD-PACK, TRANSFER-PACK, ADSOL and FLEX-EXCEL are trademarks of Fenwal, Inc.
© 2018 Fenwal, Inc. All rights reserved. Each unit consists of a PL 146 Plastic primary container with 70 mL of CPD solution containing 1.84 g Sodium Citrate (dihydrate) USP, 1.78 g Dextrose (monohydrate) USP, 209 mg Citric Acid (anhydrous) USP, 155 mg Monobasic Sodium Phosphate (monohydrate) USP, pH may have been adjusted with sodium hydroxide; one 400 mL PL 2209 Plastic Satellite Container with 110 mL of ADSOL™ red cell preservation solution containing 2.42 g Dextrose (monohydrate) USP, 990 mg Sodium Chloride USP, 825 mg Mannitol USP, 30 mg Adenine USP; one empty 400 mL PL 2209 Plastic TRANSFER-PACK™ container; one integral SEPACELL™ FLEX-EXCEL™ red cell leukocyte reduction filter and one empty 450 mL PL 2209 Plastic TRANSFER-PACK container for the storage of AS-1 red blood cells, leukocytes reduced. II)Unused units removed from foil pouch are returned to the foil pouch within 12 hours. Units may be removed from the pouch and returned only once. FENWAL, BLOOD-PACK, ADSOL, TRANSFER-PACK and FLEX-EXCEL are trademarks of Fenwal, Inc.